Spring is just around the corner and soon we will be back in the fields. To prepare for this spring, we want to talk a little about minimizing the effects of 1,000 variables that Mother Nature will throw at you. Controlling the 5 factors listed below will set your operation apart from the others each and every year! Soil – What are the ideal conditions to plant into? Knowing when the soil is perfect takes both the science of seed and soil. An old rule of thumb was to plant your crop based on the calendar. While it is important to get your crop planted in a timely fashion, nothing is more important than the conditions you plant into. Corn will yield the best if planted when soil is 50 degrees or higher, with a steady increase of temperatures in the forecast. Perfect soil conditions start with the first tillage pass. The ground must be level and firm. The residue must remain sized and high in the soil column to keep it out of the seed trench where it can disrupt germination. Ensuring the seed trench has good tilth, is not smeared, and is closed effectively will help in producing a great stand. It is always better to wait 24 hours for better soil conditions than to simply push the envelope and cross it off the list. You only get 1 chance to plant the crop per year and patience pays in the form of yield! Seed Placement – What is the ideal depth to plant? Depths of 2 – 2.25 inches are most favorable for corn. Be cognizant of your speed as over 4 miles per hour could result in too much fluctuation in depths due to row unit bounce. Uneven planting depth will lead to uneven emergence. Keep in mind that a plant that emerges 24 hours after others will never catch up or produce to its fullest potential! 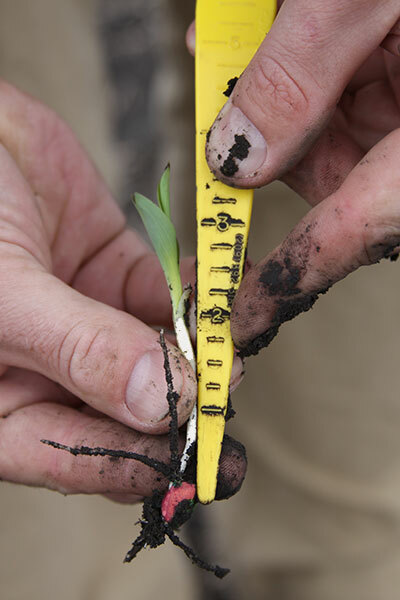 Depths of 2-1/4” will ensure that the corn plant grows its full set of nodal roots and can handle the stresses and needs of the growing season. Starting with the right seed for your soil conditions is only the beginning. As you know, you can’t control Mother Nature. How you handle what she gives us is the one thing you can control! It’s not just about picking the right genetics; it’s about matching the right germplasm to the right field as 75% of all varieties never perform to their potential because they are planted on the wrong piece of ground. If you have started with high quality seed, you must not place it in harm’s way! The first 48 hours that the seed is in the ground are the most important. Planting into suspect conditions, ahead of a cold rain, or in wet soils with residue in the seed trench will sacrifice even the highest of quality seed. Post-Planting Management – After the planter is in the shed. Proper post planting management starts with a plan! We will address some of the challenges and strategies in our April Blog. Do you have questions on how to increase your production as you nurture your field this growing season? Ask us below or Contact Us today!